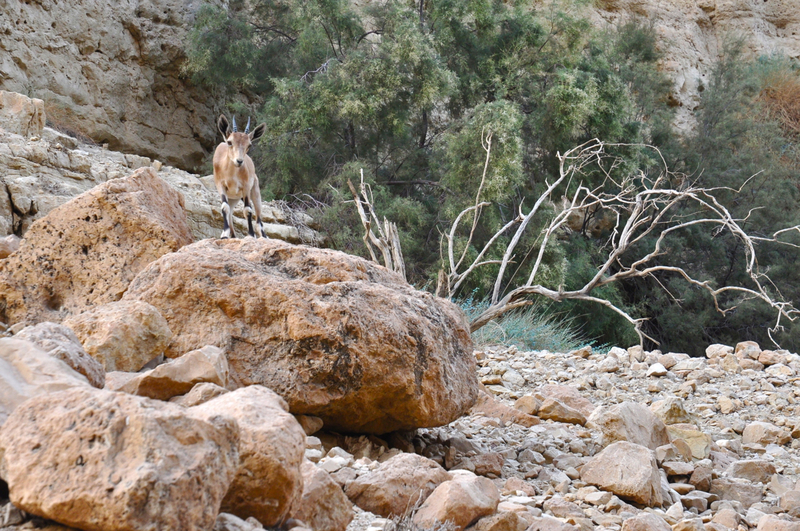 These two wildlife photos were taken on a hike in Nahal Arugot in the Ein Gedi Nature reserve. Nahal David is the more popular, family oriented part of the reserve which makes Arugot great for a more off the beaten track outing, less crowded and great for photographers. If you follow the stream bed to the end of the wild and photogenic canyon you will reach the hidden waterfall. The ibex (Capra nubiana) is one of 9 species of wild goats (the North American Rocky Mountain goat is in a separate genus, Oreamnos). The ibex is a ruminant, meaning they have four-chambered stomachs and chew their cud so they are kosher, along with addax, antelope, bison, deer, and giraffe. Evidence of the ibex is widely present in the archaeological record, for example, rock drawings, pottery and seals, particularly in the Near East and Mediterranean regions. The technical details – the above photo of a young ibex was taken with a Nikon D90 digital SLR camera with Nikkor 18-70mm lens at the end of October (ISO 500, 70mm, F9 at 1/125 sec) in Nahal Arugot. The rock hyrax (Procavia capensis, in Hebrew שפן הסלע) is a medium-sized (~4 kg) terrestrial mammal, superficially resembling a guinea pig with short ears and tail but, in fact, the hyrax is related to the modern-day elephant. The rock hyrax inhabits rock crevices which protect it from predators as written in Psalms 104,18 סלעים מחסה לשפנים, rocks hide the hyrax; it also uses sentries, one or more animals take up position on a vantage point and issue alarm calls on the approach of predators. Among at least 21 vocalizations that the hyrax can make, it makes a loud grunting sound while moving its jaws as if chewing which may be the reason that the hyrax is listed in Leviticus 11,5 as a non-kosher animal that chews its cud. Unique to hyraxes is the dorsal gland, which excretes a skunk-like odor used for social communication and territorial marking. Hyraxes typically live in groups of 10–80 animals, and forage as a group. 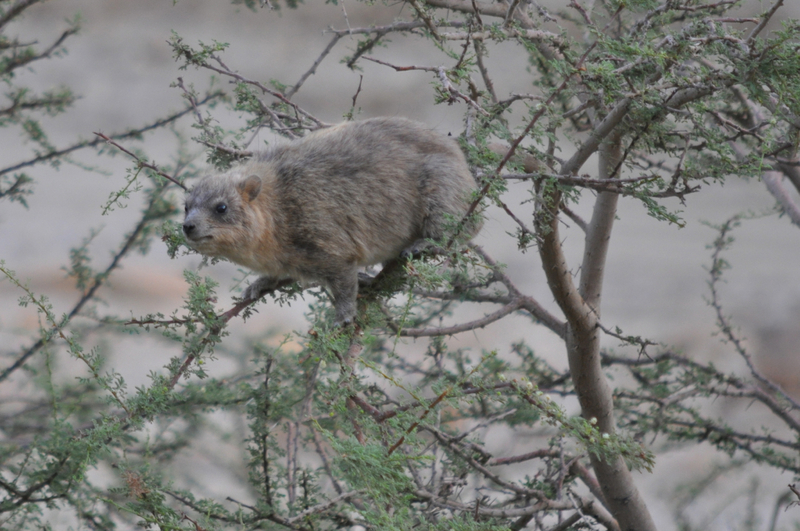 The rock hyrax has incomplete thermoregulation and so can be seen sunning itself on rocks – it spends approximately 95% of its time resting. This entry was posted in Desert, Hiking, Nature, Photography and tagged Dead Sea, Ein Gedi, hidden waterfall, ibex, Nahal Arugot, rock hyrax, wildlife photography on October 7, 2013 by Shmuel Browns. What adorable photos! Were you lucky to be able to take these photos, or is it common to see wildlife there? Ein Gedi is one of two places in the Judean desert with water so there is a good chance to see ibex and hyrax there. As a guide I can take you to places in Israel to see wildlife and birds.